The Phantom Nano Carbon Ceramic window film, by Rayno Window Film, uses innovative technology to equip your car with all the advantages of both carbon and ceramic window tints. Rayno Window Tinting has reduced the haze caused on car windows while retaining its incredible durability, and enhanced color stability while maintaining high visibility. 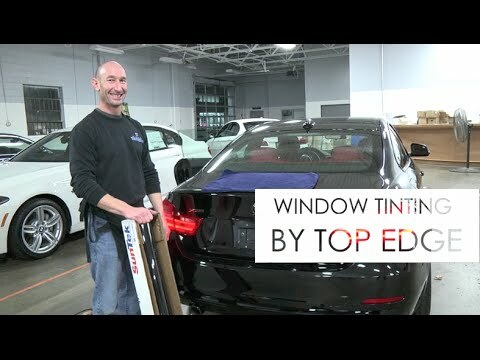 This new innovative product is a recent addition to the Top Edge Window Tinting film collection. Traditional dyed films tend to fade and discolor over time with exposure to UV light and humidity; these films have approximately a 3-5 year lifespan. Not only that, they offer little to no protection from infrared rays (IR) that can impair your vision over time. Many brands add a derivative of ceramic in hopes to take advantage of ceramic’s high IR rejection. However, this method proves faulty, as ceramic shows an even greater oxidation and fading rate than traditional films. Rayno discovered a smarter solution. The ceramic particles in our premium Phantom line are individually encapsulated for increased durability and guaranteed color stability. This means you get a dye-free and metal-free solution with an unprecedented less than 1% fading resistance that keeps you protected and the car looking good for years. Window film should not only make your car look good, it should make you feel good by protecting you from harmful rays that can deteriorate your eye sight and accelerate skin aging, causing wrinkles and even skin cancer. In order to understand the health benefits gained from using our window film, understanding of the amount of Total Solar Energy Rejected (TSER) by the film is a crucial factor. Like infrared rejection, TSER is a factor in how much heat is allowed into your vehicle, but TSER also measures the amount of skin and vision damaging light that is emitted into the vehicle as well. During independent testing Rayno Phantom Series films improved TSER by up to 60% and cut harmful UV and infrared rays by nearly 99%. Rayno’s patented Nano technology including nano-particle size control, nano formulation, and nano coating dramatically improves visibility by preventing light scattering and haze. Rayno Phantom series film provides clear vision during nighttime or rainy conditions and will allow you the peace of mind when adverse weather conditions come about or nighttime trips arise. Contact Top Edge Window Tinting today to learn more about our Long Island Clear Bra (PPF) and Car Window Tinting services.